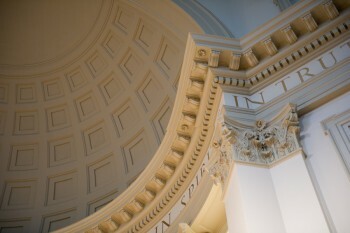 One possibility for Family Weekend is to read the inscription inside the Hendricks Chapel dome. Your family and friends arrive on the Syracuse University campus this weekend to explore your home away from home during Family Weekend, Nov. 1-3. What to do? Show them your favorite haunts and check out the variety of unique offerings through the Parents Office. Here are some highlights and additional suggestions you may or may not have thought of. Explore the beauty of Hendricks Chapel. Read the inscription inside the chapel’s dome. Taste the goodness of Food Services. Enjoy brunch or dinner—and the variety of meal options—in a dining center. Baked potato bar, anyone? Get a workout. 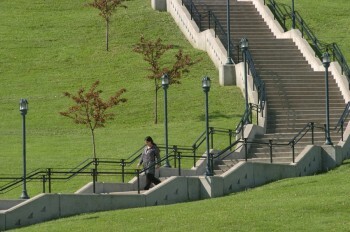 Climb the steps from University Place up to Crouse College. View the heights. Ride the free, 200-foot zip line as part of the Connective Corridor and community “Zip Fest” Street Fair and Food Truck Rodeo on East Genesee Street. Prep for the big game—SU Basketball Friday night and SU Football Saturday afternoon. Head to the University Bookstore in the Schine Student Center to outfit yourself with all the accessories that will shout Orange—hair accessories, beads, pennants and even your own striped bow tie. See the sights. Find the patio between White and MacNaughton halls and ponder the views of the city and valley below. Take the bus. Grab the free Connective Corridor bus from the University to explore the cultural sites and venues as you head to downtown Syracuse. Venture down to Marshall Street. You’ll find specialty shops, pizza, a Department of Recreation fitness center, and unique eateries and pubs—and did we mention pizza? Fill up. Grab a cup of coffee at Pages café on the first floor of the Learning Commons in Bird Library before checking out the Special Collections exhibition “John James Audubon and the American Landscape” on the sixth floor. Soak up the atmosphere. Pick a bench on the Quad and people watch. Coordinated by the Parents Office within the Division of Student Affairs, Family Weekend allows your loved ones the opportunity to meet your dean and faculty members, attend campus lectures and events, visit community establishments and cheer on the Orange at sporting events. Get a workout. Scale the steps from University Place up to Crouse College. On Friday and Saturday, the Parents Office will have a hospitality suite located in the Panasci Lounge at Schine Student Center that will have campus-wide information available to family members. Throughout the weekend, you and your family will be able to participate in a variety of information sessions, cultural events in the community and recreational activities throughout campus. Join the Parents Office at the “Meet the Parents” kick-off event with student performances on Friday from 5-7 p.m. in the Goldstein Auditorium in Schine. The event is free, but tickets must be picked up at the Schine Box Office. A complete schedule of the weekend’s events can be found at http://parents.syr.edu/documents/fw2013-schedule.pdf. To register for Family Weekend 2013, visit http://parents.syr.edu/apps/familyweekend. For more information on Family Weekend 2013 or the Parents Office, contact parents@syr.edu or 315-443-1200.